WELL DOGBONE. GIVE ME A BONE. ARE YOU SURE THE RNBW STARLINE HAS 6205 LH/WENDY. THAT DOESN'T MAKE SENSE. THEY ALREADY ISSUED 6259 BA / LH ON THE BROWN SERIES . THERE WASN'T ENOUGH BB SONGS IN THE CATALOGUE TO PICK ANOTHER SONG OTHER THAN LITTLE HONDA. I PUT THE STARLINE SERIES OF BEST OF VOL 1 AND IT IS VOL 1 THE SPINE OF THE LP COVER IS THE OFFICIAL TITLE. AND IT STATES VOL.1. ANYWAY IT'S ON YOUTUBE UNDER TOKENBEACHBOY54 AND I'M STILL MISSING AT LEAST 3 . IF DOGBONE HAS ANYTHING TO ADD TO THIS STARLINE BEST OF VOL.1 PLEASE DO. I AM AN EXPERT WHEN IT COMES TO THIS ONE. I KNOW MY STARLINE 45'S BUT I BURIED THEM AND I'M DUSTING THEM OFF AND WILL SCAN THE REST OF THEM. I HAVE TOTAL OF 75 BUT 10 OF THOSE ARE SURFIN USA ON THE BROWN LBL. I'LL BE PUTTING THE IGA CG LSN SJB SERIES UP ON YOUTUBE NOW. AS FAR AS THE CANADIAN GOES BLUEBIRD OVER THE MOUNTAIN HAS A RED & WHITE TARGET LABEL. IHAVE I CAN HEAR MUSIC ON THE CANADIAN RED & ORANGE TARGET BUT WHEN I BOUGHT BLUEBIRD IT WAS IN DELETED PACKAGE OF TEN RECORDS AND IT WAS YELLOW SWIRL THAT WAS BACK IN DEC 68. I'M NOT SAYING IT DOESN'T EXIST. BUT IF I SAW THAT BLUEBIRD CANADIAN IN THE RED & ORANGE TARGET THAT WOULD BLOW ME AWAY. SO WOULD THE BA/GOOD VIBES 6132 ON THE BROWN STARLINE. I'M INCOMPLETE WITHOUT IGA PURPLE 5174. IN FACT I FEEL INADEQUATE AS A BB COLLECTOR BUT NOT ONLY AS A BB COLLECTOR BUT WHEN YOU'RE OVER 50 NOT EVEN VIAGRA CAN HELP ME . BUT IF YOU WERE TO SCAN THAT PURPLE IGA 5174 AND GET IT TO ME, ALL OF A SUDDEN BOINGGGG!! I'M BACK IN BUSINESS. AND MY WIFE WILL BE HAPPY TOO. SEE HOW SOMETHING THT SEEMS SO TRIVIAL CAN AFFECT OTHER PARTS OF YOUR LIFE, SO TO SPEAK. DOGBONE DO YOU HAVE THE IGA 5174 PURPLE CAN YOU SCAN A PHOTO OF IT ON HERE. I am working on getting the bugs out of scanner. My computer crashed a few months ago and I've not really had the time to really mess with getting everything back in order. But tonight, I did uninstall my scanner/printer software, and did reinstall it...so hopefully I'll be able to scan something for you shortly. The other problem is simple. My collection is in storage, so I will have to retrieve a few boxes, and fine the records. So, tell your wife to get ready....cause the PURPLE IGA is coming shortly. I've made an attachement to see how to do it. This is only a TEST photo. ARE YOU SURE THE RNBW STARLINE HAS 6205 LH/WENDY. THAT DOESN'T MAKE SENSE. THEY ALREADY ISSUED 6259 BA / LH ON THE BROWN SERIES . THERE WASN'T ENOUGH BB SONGS IN THE CATALOGUE TO PICK ANOTHER SONG OTHER THAN LITTLE HONDA. Yes, I'm sure. When I bought the whole set...I came home and started looking and comparing them to the other issues. I was just as surprised to see the Little Honda/Wendy issue, but it's for real. Hang tight, and I'll get a scan of it shortly. I agree though. They could've issued another song in it's place. Perhaps "All Summer Long" would've been a good choice. I don't believe I have the Canadian BLUEBIRDS on the Red and White Target...but I do know of it. I do have the Canadian I CAN HEAR MUSIC on the Red and Orange, and saw the Canadian BLUEBIRDS on this SAME label on EBAY a few years ago. Unfortunately, someone outbidded me. But that's life. I'll keep looking and find one sooner or later. It does exist. I'm 100% definite of it. GV/BA on 6132 exists as well. I'm 100% definite of that one as well. Just not many copies around. I am, already watched a few of your video's! In The Netherlands the "4 By The Beach Boys" wasn't released. Instead we got an (unsuccesful) 45, Little Honda / Wendy. So I guess the combination itself isn't that strange. Well, the original issue of LH (6204) with "Wendy" was a Starline reissue of the two sides that charted off the "Four By The Beach Boys" EP in 1964. This SHOULD have both songs in their original mono mixes (if someone could verify that, please ) The 6259 issue brought Capitol 4110 (originally an orange label "new" release promoting SPIRIT OF AMERICA) to the Starline series, and Capitol probably didn't have to produce any new metal parts for this reissue, using the orignal ones from 4110 (and therefore saving money). I think both sides of this should be stereo (true stereo for LH and Duophonic fake stereo for BA). Anyone able to verify that one too? This brings up the fact that there are two single versions of "Barbara Ann" - one on the original 1965 single (which was reissued on Capitol Starline 6132), and a slightly longer fade version on Capitol 4110 (2:11 in length, and reissued as Starline 6259). Linett's been using the 2:11 version for all his CD's, but Andrew Sandoval used the original shorter version from the 1965 single on the GREATEST HITS VOL. 1 CD. Oh, and TOKENSURFER, more acetates, please! Some amazing stuff there! I believe you meant to say "6205" instead of "6204" from your post. Either way..when I get the boxes from storage, and dig out the singles, I will try to give them a quick listen to see if in fact there are MONO and STEREO mixes. I believe your info about the 4110 single is correct--but I will try to verfify which mixes did infact end up on the singles 6259 and of course 6205. I will add, nearly all of my Starlines are MINT never Played. I usually bought them new, and just put them away. There was no reason to play them, as I usually played the LP. As for Sandoval using one mix and Linnett using the other, this seems to be a questions which Mark should be able to answer, or even Alan Boyd. There may be good reason for one mix versus the other. I FINISHED THROWING THE FOOTBALL TO A BUNCH OF 12 13 YR OLDS MY BACK WAS KILLING ME. ANYWAY NO PUN INTENDED ON THE WIFE REFERENCE. TELL YOUR WIFE TO GET READY THE ICA WILL BE COMING SHORTLY. LESS EMPHASIS ON THE SHORT PART PLEASE. I HAVE THE 45'S READY AND I COULD LISTEN TO THEM I SUPPOSE JEFF AND TELL YOU TOMORROW. CAN YOU PUT THE REST OF THOSE IMMACULATE GREEN SWIRLS ON HERE. JEFF I'M GLAD SOMEONE NOTICED THOSE TRACKS. IT 'S FAR MORE IMPORTANT THAN THESE DAMN STARLINES. WHICH IS WHY WE LOVE BRIAN SO MUCH. HE CAME UP WITH SO MANY GEMS. I LIED AGAIN I AM MISSING ONE PURPLE DANCE DANCE 6106. I ALSO HAVE ALL THE STARLINE SLEEVES WHICH WILL BE POPPING UP ON YOUTUBE. IN CANADA IT WAS WENDY/ SHE KNOWS ME TOO WELL(5245) AND WHEN I GROW UP/LITTLE HONDA THAT WAS ON THE CANADIAN CAPITOL 72000 SERIES. YOU'LL NOTE WENDY IS ON THE WHEN I GROW UP LABEL # IN CANADA. AND SMILE DON'T FORGET TO ENJOY THE MUSIC IT'S THE REASON WHY WE COLLECT THE VINYL. THOUGH THE MAJORITY ARE SATISFIED WITH THE MUSIC. AND NOT THIS CRAZY STARLINE STUFF. DOGBONE DID YOU CHECK THE BROWNSTARLINE I HAVE ON YOUTUBE. AND FIGURE WHICH ONES YOU HAVE THAT I DO NOT HAVE AS FAR AS VARIATIONS GO. AND DON'T FORGET TO LISTEN TO THE RARE ACETATES ON THERE. AND JEFF THERE'S ANOTHER ACETATE FROM MY FAVE SONG OF BW OUTSIDE THE BB. I DO INSTR ACETATE. VERSION. NO ORGAN BUT HEAR THE TRIANGLE AT THE END OF I DO IT'S HERE COMES THE BRIDE . THE ACETATE IS A BIT NOISY BUT IT HAS LOT MORE PUNCH THAN THE DILUTED STEREO VERSION YIKES ! AND BRIAN'S WOULDN'T IT BE NICE IS MY FAVE SONG OF ALL TIME . NO MATTER WHAT MOOD I'M IN. I NEVER GET TIRED OF IT. I DO BY THE CASTELLS IS A CLOSE SECOND. OK GUYS HERE WE GO. Okay...I finally made it work. Dam..took me all night..and it's early morning. I also checked the RAINBOW Starline Barbara Ann b/w Little Honda Capitol 6259, and it plays like this: Barbara Ann in Duophonic and Little Honda in Stereo...just like the Capitol 4110 (released from SPIRIT OF AMERICA back in 1975). As I said...YES, I do have the Purple Label Reissue of I Get Around b/w Don't Worry, Baby Capitol 5174. It does exist. Here are two LARGE Jpegs..so you can copy them, and get on with giving your wife, what the Viagra couldn't do!!! Who gets a BONE now?? Hope these look okay. My scanner is "sh*t", and you don't want to hear what I went through to get these scanned. Enjoy, now you can go crazy trying to find a copy!! I bought this copy in about 1980..and I don't think I've ever seen another one. This one's gonna cause a fuss. I saw this on EBAY about 7-8 years ago. I couldn't believe it. I contacted the Seller to confirm that it was in fact GV/BA. She said, "Absolutely". She also said, "It's from my daughter's collection--sorry for all of the writing on the labels!!" I bid $0.99 and won it. A few months later, I happen to be in contact with someone, who didn't believe it. I xeroxed and sent the xerox to him. This is the same xerox, I believe BEACH HEAD was talking about. At least, I assume it is. I didn't want to say anything, until I found it in my storage. So..it does exist. I've never seen another copy. Both sides are scratchy--from the wear and tear, but clearly sound MONO. 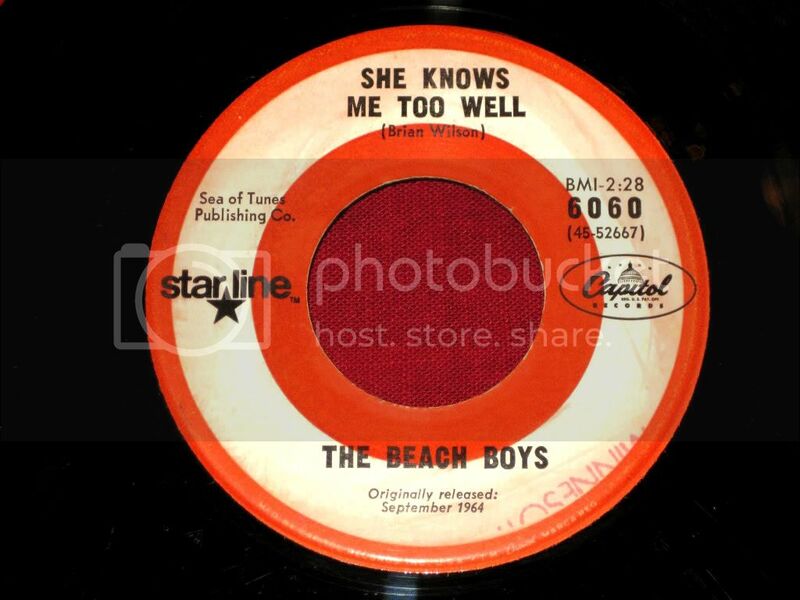 The Barbara Ann label states "2:53" as the time (like the LP Version), but the record is actually the "2:06" edited version, like on the Red and White Starline issue. Publishing details are clear in the JPEGS. Based on the "Sea of Tunes"...this may have been printed before Murry Wilson sold the publishing rights. Everything is scratched in. The Hz is more like HZ...where the top arm of the Z connects to the cross bar on the H. There are (), rather than  and the Barbara Ann side has a small Diamond shape following the 2. I tried to reflect it using the <> but it's very faint on the record..may not be a mark at all. This also has the "C" Type Logo, and a non slip ridge, encircling the outer edge of the label. A bit beat up, yes....this is exactly how I bought it. Hello there! I'm new to joining this forum, but have beed reading it for a long time. I have a Beach Boys Star Line 45 that hasn't been mentioned yet. 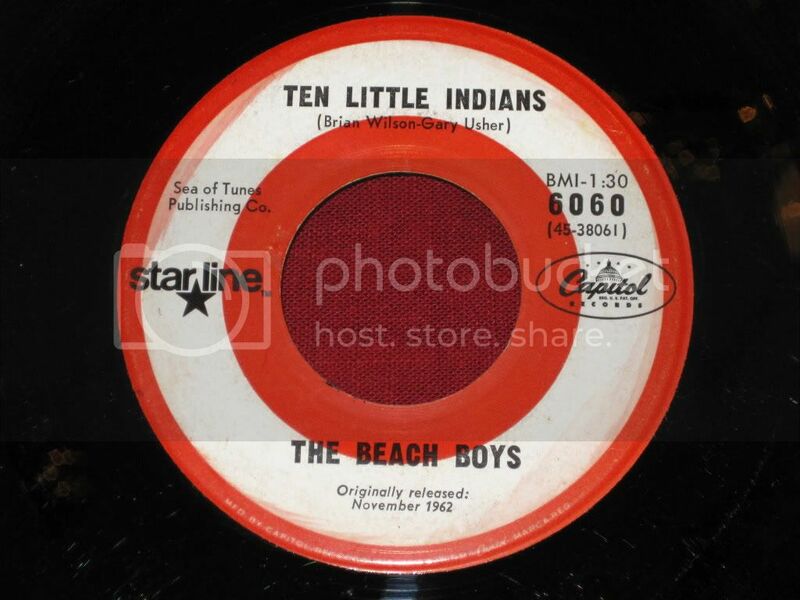 It's a copy of TEN LITTLE INDIANS/ SHE KNOWS ME TOO WELL on the red/white target label. I'd love to post an image of it, but I can't figure out how to do it. Can anyone help me? Thanks! WOW NEEDLESS TO SAY THE GODD VIBES 6132 BLOWS ME AWAY. MORE SO THAN THE PURPLE I GET AROUND I HAD THE OTHER PURPLES I KNEW THIS EXISTED IN PURPLE. BUT GOOD VIBES IN THE BROWN STARLINE NEVER DID I SUSPECT IT EXISTED. THANKS FOR SHARING THIS ONE. I WILL TELL YOU WHY IT'S SO RARE CHANCES ARE IT HAD ONLY ONE PRINTING RUN AND A SHORT RUN AT THAT. IRVING MAY HAVE BEEN LAX IN CHANGING IT FROM SEA OF TUNES TO IRVING. BUT I GUARANTEE WARNER BROS. WASN'T LIKE THAT. SO WHEN THEY BOUGHT THE CAPITOL CATALOGUE FROM PET SOUNDS TO 20'20. GOOD VIBES WAS IMMEDIATELY PULLED FROM THE CAPITOL PRESSES. AND THAT'S WHY THIS STRANGE LOOKING ANAMOLY EXISTS FOR ONLY A SHORT PERIOD IN LATE 69 OR EARLY 70. IT'S A SHAME 15 WAS WRITTEN OVER GOOD VIBES. I WILL NOW BE FOREVER LOOKING FOR THIS ONE. I WILL TRY AND CLEAN IT UP DIGITALLY HOWEVER. THE IGA PURPLE GIVES ME PEACE OF MIND. BUT THE BROWN 6132 GAVE ME A RUSH I HADN'T FELT SINCE I GOT A NEAR MINT CANDIX 331 8 YRS AGO. HOLD ON BROTHER 1002 YOURS IS JUST AS STUNNING AS THE GOOD VIBES TO SEE TEN LITTLE INDIANS ON THE RED & WHITE HOLY SMOKES. I HAVE BEEN HUMBLED. WOW TEN LITTLE INDIANS. WELL SMILE HOLLAND . I AM GLAD YOU BROUGHT IT UP. WE ARE FINALLY GETTING A COMPLETE ,PICTURE OF WHAT'S OUT THERE. WITH ALL THE BROWN STARLINES I HAVE AND THEIR VARIATIONS AND MY PURPLE STARLINES. WITH DOGBONE'S RNBW STARLINES.AND HIS ODDITY STARLINE THEN YOU HAVE BROTHER 1002 WITH HIS TEN LITTLE INDIANS RED & WHITE. DON'T FORGET DOGBONE TO POST THE REST OF THE RAIN BOW AND I WILL SEND MY STARLINES IN A ZIP STYLE FILE TO JEFF IF HE OR WHOMEVER WANTS TO PUT UP THE COMPLETE STARLINE COLLECTION. SMILE WOULD YOU CARE TO DO IT. IT WAS YOU WHO BROUGHT THE SUBJECT TO OUR ATTENTION. Hello, brother 1002, welcome on this board, and thans for your first contribution. I hope you can forgive me for modifying your message with the Ten Little Indians pictures. This way we can see them directly. TokenSurfer, I'd be honoured to make a complete overview of "what's out there". And indeed, I "only" brought this subject to anyone's attention, that would be my sole contribution, because you guys did all the hard work. I'll try to make a start with it, later this week. Of course, as long as there are further additions, I'll modify the list. @ Tokensurfer: I don't think you deleted anything. I sent you an "friends"-invitation on YouTube (my account is SmilingDutchman), and yesterday I noticed you accepted (and thanks for that! ). I'll send you an e-mail this evening. Don't have a MAC, so no clue if that's going to give any troubles... we'll see. I happen to have some nice graphic software on my PC so I might be able to wipe that "15" on the Good Vibes 45 away. I'll let you know about the results. While SMiLE-Holland assembles the visual guide to what’s available in Beach Boys Starline singles, I thought it might be worthwhile to make a text list as an aid to such an assembly. From my own knowledge and collection, plus everything that’s been contributed to this thread, plus everything I can find on eBay, this is what I’ve been able to pull together. I’ve restricted the list to only Capitol 6000-series Starline singles, ignoring all the non-Starline reissue singles, as well as that odd “Beach Boys Medley” 45 on the Rainbow Colorband Starline label (it’s not in the 6000 series). Also, I’ve restricted the list of label variations to those that seem to be deliberate, planned label changes, leaving off things like varying stereo/mono designations and publishing companies, as those seem to relate more to printing plant differences than anything else. CHANGES AND UPDATES ARE WANTED! And this is the corollary to THE LIST. I feel certain some of these exist. For example, it makes no sense that 6059 (Be True To Your School/In My Room) and 6106 (Fun Fun Fun/Why Do Fools Fall In Love) don’t exist on a Blue Starline label. Similarly, 6105 (Dance Dance Dance/The Warmth Of The Sun) and 6204 (When I Grow Up/She Knows Me Too Well) should exist on the Purple Starline label. In each case, the rest of the Starline catalog exists on those labels, so why not those particular discs? I’m especially curious about whether 6204 (When I Grow Up/She Knows Me Too Well) and 6205 (Wendy/Little Honda) exist on the missing later Starline labels? Did 6204 go out of print after the Blue Starline label? And now that we know 6205 exists on the Rainbow Colorband label, should we be looking for copies on the Blue and Purple labels? GOOD JOB IN PUTTING THAT TOGETHER BEACH HEAD . I ALSO DID THIS A ALONG TIME AGO. BUT WITH LESS INPUT. I FELT LIKE I WAS THE ONLY ONE INTERESTED. I THINK DOGBONE WILL AGREE THAT WIGROWUP 6204 STOPS AT THE BLUE. THERE ARE NO RNBW AND PURPLE. WENDY 6205 FOOLED ME I THOUGHT IT STOPPED BEFORE THE RAINBOW. BUT I KNOW IT DOES NOT EXIST ON THE PURPLE AND I COLLECTED THEM ALL WHEN THEY FIRST CAME OUT. . I KNOW I CAN'T FIND DANCE DANCE DANCE PURPLE BUT I HAVE IT SOMEWHERE IN MY MASSIVE RECORD COLLECTION. AND THE RED & WHITE SURFIN SAFARI. I ALSO MISPLACED . I CAN'T BELIEVE I CAN'T FIND THOSE TWO. DO YOU DOGBONE HAVE THE REST OF THE BLUE STARLINES THAT I AM MISSING. BTW PURPLE IS A HARD COLOUR TO SCAN . THE PRINT IS HARD TO SEE. I HAD TO BRIGHTEN AND ALTER THE COLOUR A LITTLE FOR THE PRINT TO SHOW UP.